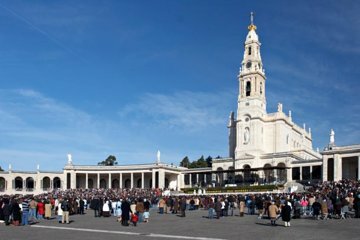 Delve into the famous religious pilgrimage site Fatima during this privately guided tour from Lisbon. This tour will illuminate the site where apparitions of the Virgin Mary (Our Lady of Fatima) were seen in 1917. Visit the basilica, pay homage at the shrine and see Sanctuary Square which is two times the area of St Peter’s Square in the Vatican. Enjoy riding in a comfortable vehicle which boasts a glass roof perfect for ogling the countryside on your voyage from Lisbon. In the afternoon, meet your guide for a pickup from your central Lisbon hotel and begin your private voyage to Fatima. As you drive north, learn about this famous religious sanctuary where on May 13, 1917 three shepherd's children allegedly saw an apparition of Our Lady of Fatima dressed in white (aka Our Lady of the Rosary). As you approach this small stone-laden town, witness how after 100 years this former olive farming village has become one of the world’s most significant places of Christian sanctity. Begin with a tour of Sanctuary Square and marvel at the town’s basilica where the three children who claimed to see the apparition are buried and honored. Admire the grandiosity of the square where thousands of pilgrims assemble every year to pay homage. Perhaps, take a candle and illuminate it in the same manner as a pilgrim in remembrance and safeguard of the Virgin Mary. We had a wonderful tour to Fatima! Our driver and guide were great - very friendly and knowledgeable. Thank you! It was a wonderful tour. Our private tour guide was very informative and thoughtful. It was an all around pleasant day! It was great. Tour Guide was exceptional with the local knowledge of the Fatima story. Extremely enjoyable. Great tour, very kind tour guide, he was very knowledgeable. It was good but a bit rushed. .The guide Ms. Mathilda was good. Our tour guide was fantastic! She catered the private tour to our needs and desires, and even helped us with suggestions for other sites and restaurants that were excellent! The guide was punctual, knowledgeable and charming. The vehicle was comfortable. And, we visited a fantastic site, receiving a history of Fatima and a feeling for the people that visit. Tiago was awesome!!!! He had great knowledge and was VERY professional and personable.